Has anyone else experienced the JCE tabs missing from K2 items? I just upgraded both Joomla and JCE. 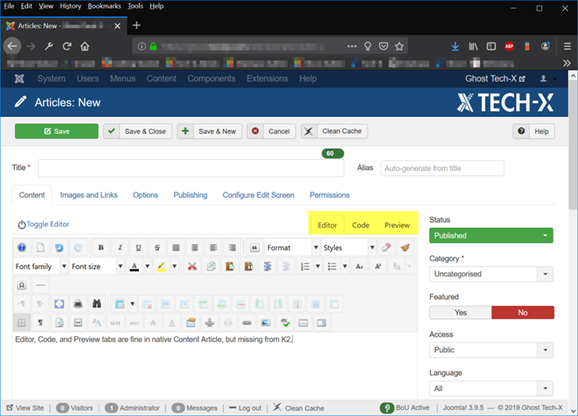 The JCE Editor, Source, and Preview tabs are not visible and only the source code view of the item is displayed. 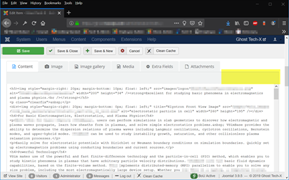 All three tabs are present in Joomla Content Articles. Screen captures of both are attached. All the usual post-installation cache clearing has no effect. Looks good on my end. Are you using a single or dual editor windows? Thank you for the reply, Fotis. I normally set Joomla's editor to JCE for everything and use one default profile for all users in JCE. However, you set me to thinking about what else could be influencing K2 Item editing, which pointed to Styleware SW Tabs Pro for K2 (2.7.7). I disabled this plugin and then the JCE editor tabs were restored to the K2 Item editing window. I re-enabled the plugin and lost the JCE editor tabs again. Mystery solved! Thank you for K2. It's the way to go for Joomla. Yeah, if it's a JS issue, it's most likely a 3rd party plugin.